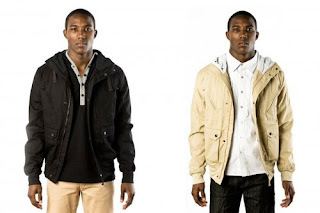 3sixteen offered up this little preview of the Spring outerwear. I will let founder Andrew Chen walk you through to two jackets. "As the weather begins to warm up slowly, we’re excited to debut the first portion of our Spring ‘09 collection. First up is our Double-Breasted Jacket. Constructed of a mid-weight khaki canvas, this cropped peacoat is what I’d consider a wardrobe staple - something that will maintain space in your closet for years to come. Although it’s unlined, you’ll find that every seam is finished with bengal-stripe oxford shirting. The jacket also features a removable neck strap." "Our other outerwear piece is the Monsoon jacket. The first iteration was released in our Holiday 2007 line and remains to this day our all-time best selling jacket we’ve made. For Spring 09 we’ve updated the fit - it’s been slightly slimmed out and though we’ve added a bit of length to it, the piece is still meant to be a high-waisted M65 variant. 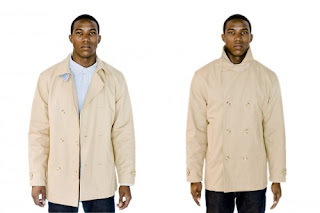 The jacket comes in two colors: khaki and black." "We’ve carefully considered the fitment and performance of the jacket, from the articulated folds in the elbows to the ergonomically positioned chest pockets which allow for easier access. While most field jackets have top-entry flap pockets which are awkward for putting your hands in, we elected to add an additional side entry." "Lastly, the entire jacket is lined with a breathable nylon mesh that will ensure that the jacket is extremely breathable during the rapid changes in temperature that the Spring season brings. The back features a vent that runs from top to bottom."